Genius Kit comes with the Osmo Base (stand & reflector), game playing pieces (including upper and lower case Word’s tiles) and stackable storage containers. Requires iPad to play. Transform a photo or gallery image into easy-to-draw lines. Draw to perfection. 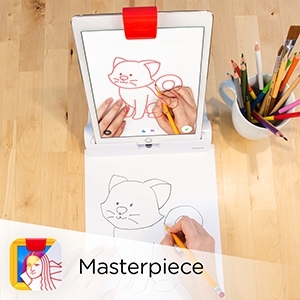 Then share a magical time-lapse video of your creation! 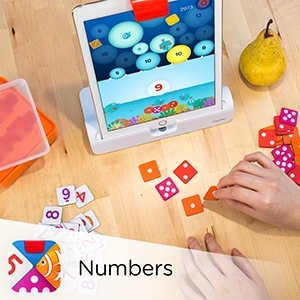 Add, count & multiply tiles to pop the number bubbles. Popping enough will free fish & unleash a lightning storm! Learn to be the numbers master. 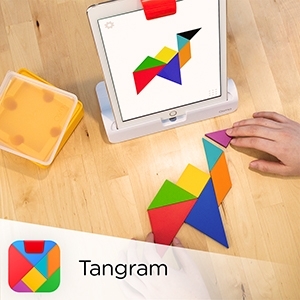 Arrange Tangram pieces to match on-screen puzzles that get more difficult after each victory. Play alone or challenge a friend! Guess and spell the on-screen image. 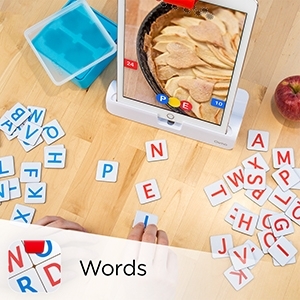 Challenge a friend in this lightning-fast word scramble. 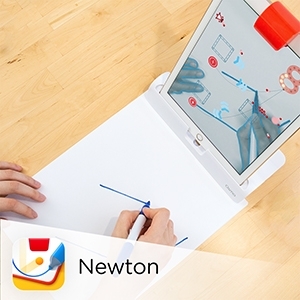 Solve physics puzzles by drawing lines on paper or placing objects, like a pen or a toy dinosaur, in front of the screen.